Divided Power, the third volume in the Fulbright Institute Series on International Affairs, focuses on the relationship between the executive and legislative branches of government in the formation of U.S. foreign policy. The book is a collection of eight essays written by political science scholars and edited by Donald R. Kelley, professor of political science and director of the Fulbright Institute of International Relations. The essays attempt to capture the struggle between the division of powers mandated by the Constitution and the political realities of the day. The authors also examine the culture and society in which those realities exist. Subjects touched on include foreign trade policy, authorizing war, factionalism and rivalries between the executive branch and Congress. Another essay focuses on long-term trends in congressional foreign policy behavior. 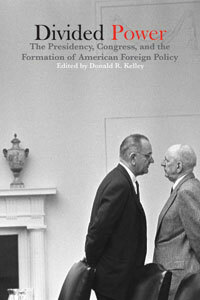 The book addresses foreign policy issues from the dawning of the 20th century to the post-September 11, 2001, era. The essays offer the reader a chance to explore the interaction of the executive and legislative branches in shaping foreign policy in modern times.